The way your family makes decisions has a lot in common with the way most companies make decisions. 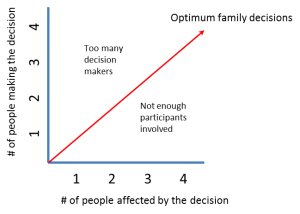 Let’s look at the graph below; the X axis is the number of people affected by a decision and the Y axis is the number of people participating in the decision. When you go out to lunch, you decide what you are having for lunch since you are the only one eating (participating) in the lunch. Now what would happen if you told your spouse and your two teenage kids your family is going away for the weekend to a specific spot, hotel and doing specific activities without consulting them? In this case, you are the singular decision maker yet your decision impacts your spouse and your teenagers. You haven’t asked them if they had other activities planned and you didn’t ask if they agreed with your destination choice or wanted to participate in your planned activities. The chances of the family enjoying the weekend have diminished based on the lack of those who were participating being part of the decision making process. The converse of your weekend decision is ineffective too. If just you and your spouse want to go to dinner, it would be inefficient to ask your kids where the two of you should go out to dinner since they weren’t invited and thus won’t be affected by the decision. For the most part, optimum family decisions are made with all members of the family if the decision affects the entire family. I have seen many marketing strategies for larger company purchases where marketing content and lead generation programs are targeted at the “C” suite. Going back to the family analogy, this is like targeting just the husband or wife when marketing a vacation spot. This singular marketing strategy negates the need for those who are participating in the activity to be part of the decision making process. I’m not saying that everyone in a company who is affected by a decision needs to participate, but the best decisions which affect a group should be decided by the group or a subset of the group, rather than a single decision maker (like a member of the C suite). The latest CMO Council Strategic Brief, The Content Connection to Vendor Selection, ¬How Online Information Sourcing Influences the Presales Buying Process, sponsored by NetLine, surveyed 350 business buyers. The brief details how marketing material flows inside a company. Only 29% of the C suite buyers surveyed shared their content downward in their company while 35% of middle management buyers shared their content upward and downward. At the junior level, 30% shared their content upward in their company. Only 6% of the surveyed didn’t share content. The CMO Council brief also confirms the fact that most companies collaborate when making larger decisions with 80% of respondents describing their decision making collaboration efforts as either fairly effective or extremely effective. Only 4% saw their decision making collaboration efforts as fairly ineffective or extremely ineffective. Since most companies are like most families, larger purchase decisions are made by a group of employees from a range of levels. Why focus on only one or two members of the decision making process? Successful marketers today need to understand that content sharing is the norm. Focusing one’s marketing content and lead generation efforts on just one member of the decision making group is less effective than writing different content which can be utilized by different levels of the organization, yet still be shared to all levels of the company. The days of marketing to the C suite and them dictating a vendor purchase are over. Today’s successful content marketing and lead generation marketers understand that a mid-level manager reading your material may produce a higher ROI because they are more likely to read your content and more likely to share that content than a member of the C suite who is bombarded by marketing material from companies who still believe that larger decisions are dictated as opposed to being decided by a group. So, next time your marketing content and lead generation activities are targeted to only the C suite, remember how your own family makes its larger decisions.